Periscope – social media’s newest “it” app. Periscope is a live streaming app owned by Twitter. The new app allows users to view or broadcast live video from their mobile devices. The idea is to “discover the world through someone else’s eyes.” There are currently more than 10 million users who have downloaded the app. As a broadcaster, you’re able to share what’s happening by you. Anyone who follows you on the app will be notified of the live stream beginning and can jump on to watch. There’s also direct and immediate interaction with those who are watching through live comments and hearts, which are similar to Instagram and Facebook “likes.” However, the broadcast will only stay online for 24 hours. So, if you’d like the broadcast to have a life after that time frame, you can save the broadcast to your phone. It can then be uploaded elsewhere. Since the app is owned by Twitter, you also can have the stream push out before and right after to your Twitter account to let your Twitter followers know that you’re “Periscoping.” Right after the broadcast you can also see your retention, total viewers, and duration of the stream. The image shows a Mashable hosted Periscope regarding Hurrican Joaquin. @afreedma and @meganspecia answered viewer questions on they needed to know about the hurricane. As a viewer, you’re able to watch and engage with the broadcaster. You aren’t just watching someone’s experience, but you are able to comment, ask questions and provide encouragement by tapping on the screen to send hearts. 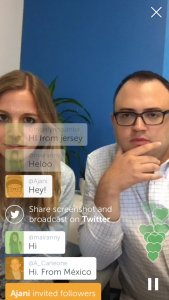 Why should a business use Periscope? Since Periscope is still a fairly new social media platform, the market isn’t as saturated as Facebook or Twitter. Unlike other sites, Periscope offers face-to-face unfiltered interaction with your clients and audience, which can build up a personal trust. Since viewers are able to ask questions in real time, they feel they’re having a conversation with the person answering. This creates a real sense of authenticity that consumers are craving from the businesses they interact with. Download the Periscope app at the Apple Store or Google Play.